A 5-a-side Football Competition will be organised by West Ham United FC & Leyton Orient FC. The competition will feature youth teams from the 14 London professional football clubs and will be open to girls and boys under 14 and under 18.
RJ Ride Guide is a professional team who specialise in Entertainment shows providing an Extreme Mountain Bike Show with a difference. Our show consists of some of the most talented riders in the UK. We have talented trials rider but who are also a phenomenal entertainer with the easy banter of a stand-up comedian, combined technique with superb showmanship with some truly jaw-dropping tricks and manoeuvres. Not only does he perform cycling miracles, he dramatizes them as he rides them. The mobile climbing wall allows climbers of all ages and abilities to experience the joy of climbing and an incredible sense of achievement. The wall hosts four different climbing routes allowing four climbers to participate at once. All climbers are harnessed and attached to the auto-belay system making them secure. As the climber ascends, the safety line retracts, during the descent or fall, the auto-belay safety system lowers the climber gently to the ground. The activities are supervised by at least one experienced climbing instructor. 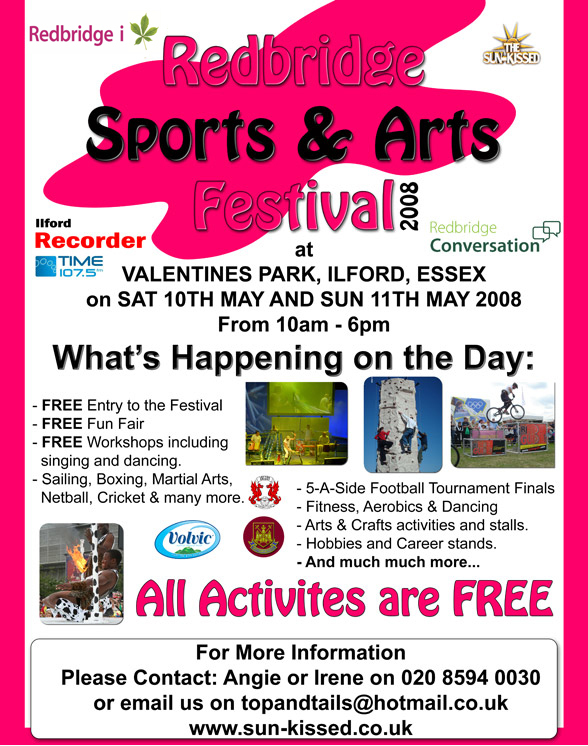 Use this opportunity to find out about your general health, measurements included height, weight, blood pressure, resting heart rate, body fat % and Body Mass Index and find out information on what is also available on the various types of physical activity opportunities within Redbridge for both adults and young people. Come and try sessions gives you the opportunity to try all aspects of the many different sports, including mini competitions, skills and agility whilst having lots of fun. Have a go at the different sports including in-door rowing, tennis, basketball, athletics, cricket, tri-golf, handball, softball, circuits, boxercise and hula hoping! Open Candian canoes, topper sailboats and trips on the rescue boats, all with a qualified instructor. Fit For Sport is the UK's leading Children's Healthy Lifestyle Activities Provider, aimed at and committed to 'keeping the future fit'. Fit For Sport currently work with over 40 schools in London providing curriculum PE, After Schools Clubs, PPA Cover, Extended Schools and Health Weeks. FFS also operate healthy lifestyle holiday kids camps at over 38 locations across the UK, catering for over 32,000 children per year. We run healthy school holiday Kids Camps at Caterham High School, Ilford, so come along to meet our team to find out more. Many different services have joined us for the day, come and have a look at what they have to offer…. Come and find out how you can get involved in a more active and successful Redbridge. The Sport and Physical Activity Team is dedicated to creating and providing opportunities for participation in sport and physical activity, which include coach education, sporting events, advising clubs and schools on grant aid and development opportunities, delivering a Healthy Lifestyle and Walk to health Programme and supporting talented young athletes and new and existing sports coaches through our Scholarships Scheme. As a new charitable leisure trust, Vision provides leisure services on behalf of the London Borough of Redbridge at the following facilities: Ilford Leisure Centre, Fullwell Cross Leisure Centre, Cricklefields Athletic Ground and Ashton Playing Fields. We will offer advice and guidance on a range of issues, from reduced car use to increased walking and come and find out about Living streets - Fitter for Walking Project! The Redbridge Conversation is about making our Borough a better place to live. We are asking everyone who lives and works in Redbridge to talk about the long-term improvements they want to see, and how the Council should pay for them. You can find out about all the Council’s investment and funding options on our website or in any Redbridge library. Talk to us at the Sports and Arts Festival you can tell us about your long-term investment priorities with the ‘You Choose’ questionnaire online, or by filling in a leaflet. Your local library on wheels comes whizzing to you with FREE membership. You can borrow books, make use of our free internet access or enjoy a story-time. For a small charge you can also borrow a CD or DVD. Whether you are interested in arts, sport or music – we can help you. Join in our story-telling at 11am; 12noon; 2pm; 3pm; 4pm. Each session lasts 15 minutes and is just a taste of the services we run in our libraries for local children and families. Or, take part in our book quiz – ask for your quiz sheet and feel free to roam around the festival asking stall-holders for help in answering the questions. With our Mobile library fully wired up for access to the Internet, you can take this opportunity to have your say in the Redbridge Conversation. This is your chance to help set the spending plan for Redbridge Council and decide if allotments or libraries need more capital investment, or whether we should concentrate on other priorities. Drugsline is an independent drugs crisis, information and support charity. It provides free and confidential information and support for people with drugs and alcohol related issues, their families and friends. We also provide a unique Education and Outreach Programme that can be tailor made to cater for each school/organisation's individual requirements and cultural needs. Contact Lisa on 0208 554 3220 to find out more. If you need help, call our Freephone Crisis & Support Line on: 0808 1 606 606. The Youth Crime Prevention Service is made up of 4 teams which aim to prevent young people becoming involved in offending in the borough. This is done though a combination of individual and group support work by specialist prevention workers, support to parents and families, work in schools and supporting members of the community. Fusion is the young people's drug and alcohol service in Redbridge. By drawing together workers from different service areas we provide Education, Advice and Treatment to young people in the borough to address the harmful effects of drugs and alcohol. Leaflets and advice will be available on how to protect your home from flooding and there will be a competition to win a "Flood Kit". Spectacular 50ft true to life, inflatable sperm whale, guarded by a noisy fishwife, who leads brave landlubbers into its belly revealing the stunning sea scape of its lavishly decorated interior. Once inside they encounter a shipwrecked pirate and a treasure-hoarding mermaid and hear their extraordinary fishy tales. Big Beat produce incredible sounds on a multi-coloured array of industrial waste - including gas pipes, kitchen sinks and plastic barrels. Audiences will be instantly engaged and amazed by the infectious beats. As Londons’ most exciting and innovative dance troupe, Boy Blue Entertainment is making waves within the dance community and intends to extend its appeal, reaching a wider UK audience and from there, international audiences fascinated with hip hop culture and dance in general. Bangers & Mash specialise in productions for children, performed using acting, puppets, songs, games and lots more, with the use of interaction between the audience and performers. They will be performing a free theatre production of George & the Dragon aimed at 4-8 year olds. Everyone’s teaching Street dance today but if you want to learn Hip-Hop the authentic way with award winning choreographers, then don’t delay. Move a step closer to being part of the hottest urban dance academy around today. So if you want to learn how to Krump, Lock, Pop, Flip, Break, Freeze, Wave and do many, many more of all the latest dance moves taking the Urban dance scene by storm, then make Taitt Academy the place for you !!! So …. Do you have the flava and funk? Honey's Dance Academy is UK's leading British Asian Dance Academy. Students have had the opportunity to take part in leading film projects like Mohabattein, Kabhi Khushi Kabhi Gham, Bollywood Queen and Indian Babu together with music videos including S Club Junior, D J Vix and Bond. If you require more information on stalls and how to book please contact us to receive your stall booking forms. © 2005 - 2008 E3UK.com. All rights reserved. Sun-Kissed.co.uk.